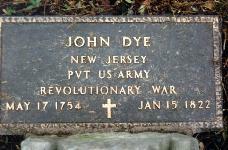 John Dye was born May 17, 1754 in Plainfield, New Jersey and died January 5, 1822 in Orangeburg, Mason County, Kentucky. He married Nancy Anne Ely in Plainsfield, New Jersey on October 14, 1777. She was born on June 9, 1762 and died on July 9, 1821 in Mason County, Kentucky. John was a private in Capt. Jonathan Combs' Company, 3rd Regiment, Middlesex County, NJ, during the Revolutionary War (DAR #191642). They migrated to Mason County, Kentucky following the Revolutionary War along with William and Kenneth Dye in 1790-1792. In the name of God Amen. I John Dye of Mason County and State of Kentucky, being weak in body but of sound mind disposing memory, do constitute and appoint this my last will and testament hereby revoking all former wills by me made. Imprimis, after payment of just debts and all funeral charges, I will and bequeath all my estate both real and personal in manner following "that isto say" that my executors hereinafter named shall dispose of my said estate upon such credit as they shall deem most beneficial and after the collection of the same that they shall equally divide the same among my children herein names, to-wit, Leticia Armstrong, Margaret Roe, the children of my deceased son William Dye, Lydia Sentney, Phoeve E. Stillwell, Kenneth Dye and John E. Dye, with this proviso that whereas, my son John E. Dye has till recently been afflicted with fits. Now in case they should return before any distribution of my estate that he should have been paid him by my Executors two hundred dollars over and above my other Children, and in case they return at any time thereafter, that the rest of my Children shall out of what they receive of my said estate equally make up that amount to him. I do hereby constitute and appoint my beloved son in law William Stillwell and my worthy friend Wins Parker, Junior, my Executors to this my last will and testament. In witness whereof, I have hereunto set my hand and seal this tenth day of November 1821. Margaret Dye was born on March 10, 1781 in Middlesex County, New Jersey, and died October 10, 1845 in Mason County, Kentucky. She married Jacob Roe on December 29, 1797. Robert Roe Dye was born on January 20, 1785 in Middlesex County, New Jersey and died on February 1, 1837 in Mason County, Kentucky. He married Sarah Wells. Lydia Elizabeth Dye was born August 31, 1792 in Middlesex County, New Jersey and died September 10, 1822 in Mason County, Kentucky. She married Lewis Sentency on March 12, 1804 in Mason County Kentucky. Kenneth Dye was born in 1796 and died in 1817 in Mason County, Kentucky. He married Charity Merrill on December 17, 1818 in Mason County. They left Kentucky and migrated to Indiana and died there in the late 1800s. They had at least 11 children and it appears that all of them were born in Indiana..
Phoebe E. Dye was born on May 24, 1792 in ____ and died on April 1, 1865 in Mason County, Kentucky. She married William Stillwell on February 10, 1810 in Mason County, Kentucky. John Ely Dye was born in 1800. His father's will notes that John Ely had suffered from the "fits" and a special provision was made for his future support. He died after a winter trip on which he was badly frozen. Kathy Smith has a web page focusing on John Dye.